Hello! Have you heard about the monthly challenges over at Pinkfresh Studio? There's a new one each month and it's a chance for you play along using the prompts. There are always some samples created by the Design Team, also, to help inspire you. 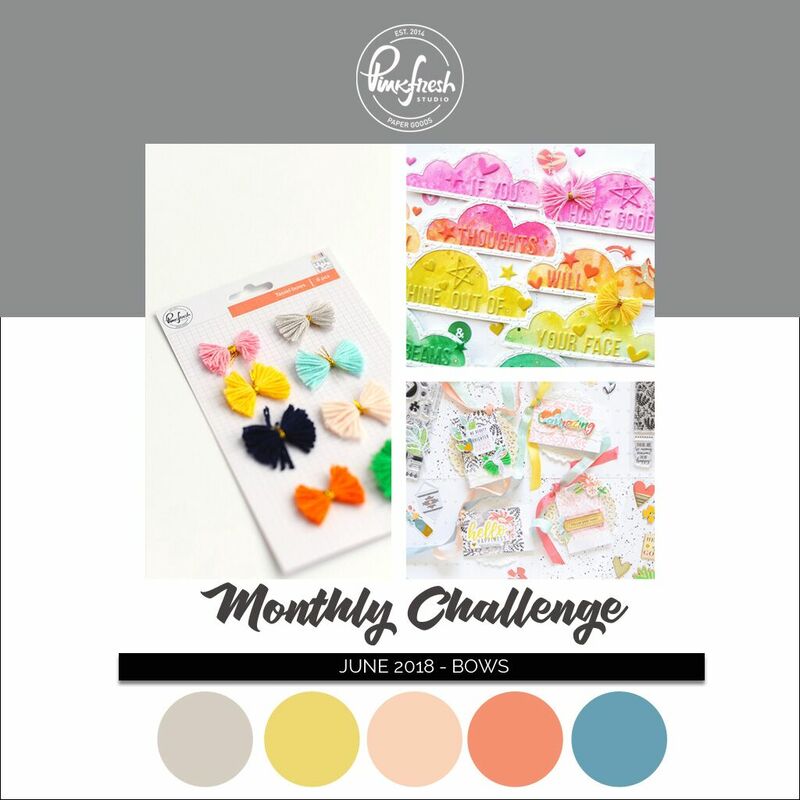 For June, it's all about BOWS (which I LOVE!!) and there's a really pretty color scheme, too. For all the details and that helpful inspiration from the DT, be sure to visit the Pinkfresh blog. You can participate in the challenge by linking up your project there for the chance to win a fun prize! 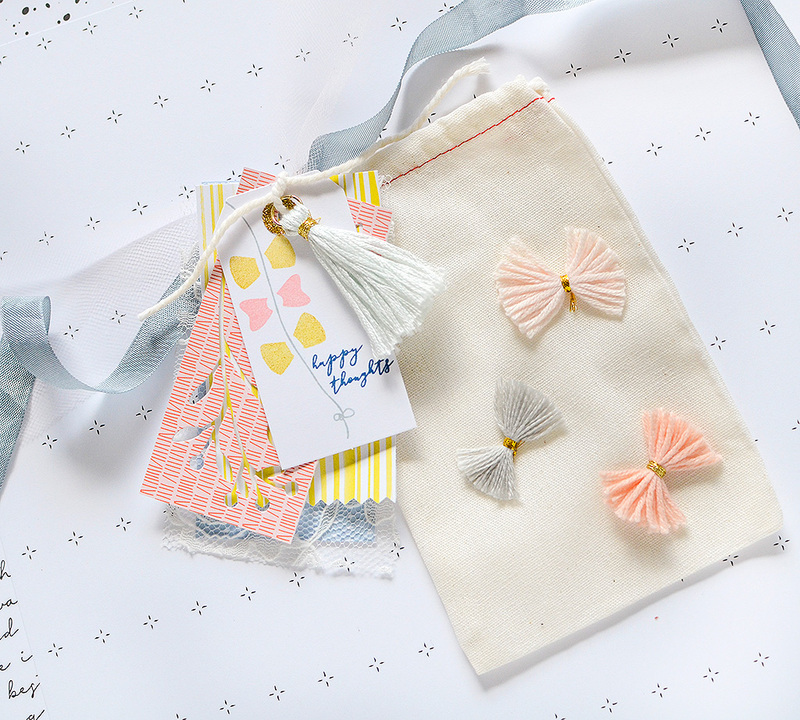 I'm excited to be participating this month and I decided to do a little gift bag featuring the tassel bows. I chose 3 for my 4 x 6 muslin bag. I believe there are 2 from The Mix, No 2 line and 1 from Be You. The bows from Be You come with a metallic purple thread tied around their centers, but for matching purposes, I removed and replaced it with metallic gold thread instead. I simply glued the bows in place, though if you're savvy enough, you can sew them on instead. 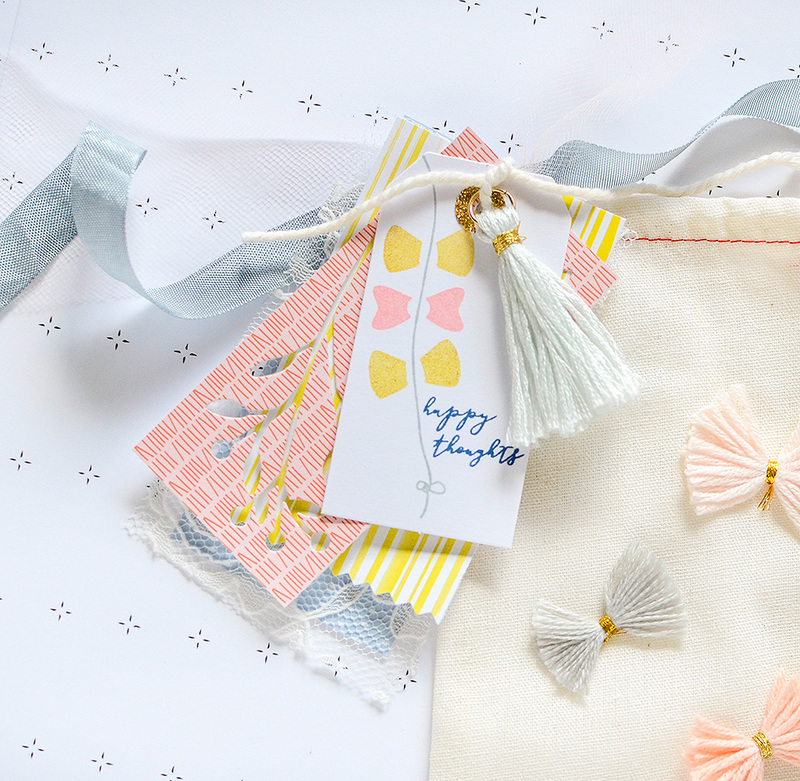 This makes such a cute gift bag idea and it's so easy! I then created some tags with patterned papers and lace, as well as a plain white tag, on which I stamped some more bows. Using the Birds & Bows stamp set, I stamped 3 bows along one of the 'strings' that is also part of the set. To the right, I stamped 'happy thoughts.' You can find that sweet sentiment in the Springfield set. The stamped bows in coral and yellow complement the tassel bows on the bag. I brought in further challenge colors from papers out of the 6x6 pads. 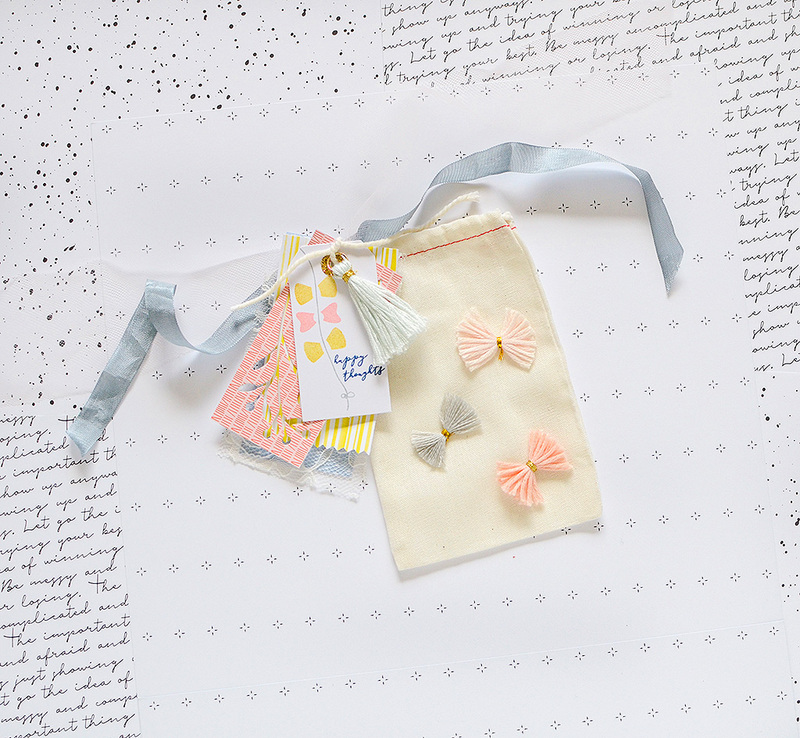 There is a light dotted blue ('Oops') and a yellow stripe ('Blah') from A Case of the Blahs, plus a pretty peachy-coral design ('Quirk') from Let Your Heart Decide. I die cut a couple florals out of the 'Quirk' paper, for a little extra interest. The dies are part of the Hello collection. Before wrapping up, I made sure there was some extra texture, from a panel of lace between the paper tags, strands of seam binding ribbon, and a light gray-blue embroidery floss tassel I made. 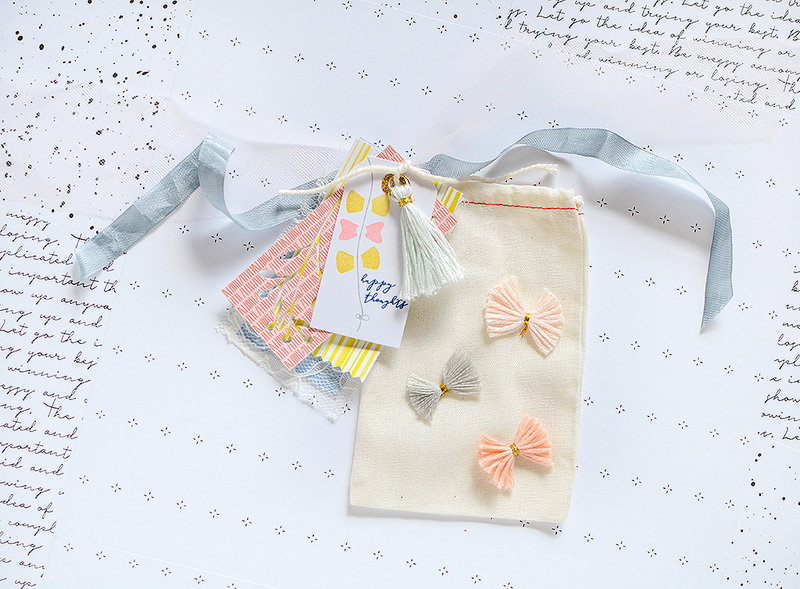 I can't wait to give this away, and I really can't wait to make more of these gift bags and tags!! If you want to join the challenge, you can! Head to Pinkfresh Studio for all the details. Have fun!